I couldn't believe it... was actually holding them in my hands. 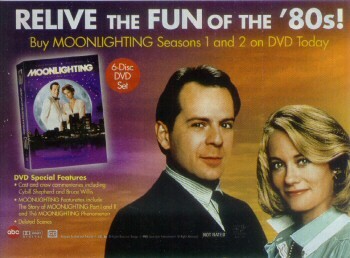 The Moonlighting Dvds! I hurriedly ripped them out of the mailing envelope, clawing at the bubble wrap and tossing it around the room. And there they were...absolutely gorgeous. I actually gasped when I saw how pretty they were. They actually seemed to glimmer, with a beautiful combo of purple and silver and a fantastic picture of Maddie and David on the cover (you know the one - from Money Talks, Maddie Walks). There are six discs in the set, and they are designed with a blue moon background on each. Five of the discs also have great pictures of David, Maddie, David and Maddie, or Agnes on them. When disc one is in the case, it shows through to the exterior and becomes a background to the cover photo of David and Maddie. It is very creative and makes the cover photo really stand out. After a few minutes of worshipping and reading the packaging and the insert, I proceeded to the DVD player. Of course, my first interest was how they looked, so I did a sampling of a few episodes. What a difference from watching 20 year old videotapes! The color is clean and crisp, actually vivid. Both Cybill and Bruce are just gorgeous...and actually, in many shots, Cybill is just breathtakingly beautiful (this is actually a subject that is hit on by many of the commentators). The shows are certainly easy on the eyes. So then I went for the extras. There are two "documentary like" features, the first in two parts. The first is called "Not Just a Day Job - The Story of Moonlighting, Part 1", and then of course, "Inside the Blue Moon Detective Agency - The Story of Moonlighting, Part 2". As expected, these tell the story of the development of the series and some inside and background information about the show. Comments are made by all the principal participants - Glenn Caron, Bruce Willis, Cybill Shepherd, and Allyse Beasley, plus an exceptional group of writers, directors, editors, and production people. The second features is called "The Moonlighting Phenomenon" and uses the same people to tell about what is was like to be part of the unique 80's experience. The print ad that ran in various magazines in late May. The two pieces are fairly similar, and quite interesting. They are full of stories that you have heard a hundred times, as well as stories that are new and fun to hear. I especially liked hearing the perspective of those who are usually behind the scenes, particularly the writers and directors. Then I went on the episodes with the commentaries. To gain some perspective, I started with the Pilot, because it is the one episode that we actually have seen looking clean and pretty, and I figured I would be able to concentrate more on the commentaries. Listening to the Moonlighting commentaries is like a dream, kind of like sitting in your living room with some good friends and watching a movie together. Lots of remember whens, and hey, look at that's, and wow, we did do a good job. I am sure I will watch some of these again and again, but I was thrilled at all of them on my first go through. There are five episodes with total commentaries, and they are all quite enjoyable. Including the pilot, as described above, these episodes include The Dream Sequence Always Rings Twice, My Fair David, Every Daughter's Father is a Virgin, and 'Twas the Episode Before Christmas. Each commentary adds its own special flair to the episodes….. Bruce making some fun insider comments about "My Fair David" and then seemingly get wrapped up in actually watching the show, Cybill and Glenn discussing perceived past differences while watching "Every Father's Daughter", as well as some good insights into some of ML's recurring supporting characters, Allysce using her Ms. DiPesto sparkle to comment on "Twas the Episode Before Christmas". I enjoyed living vicariously through all the commentators, although I have to admit, I did love the commentary of "Dream Sequence". I am a great admirer of that episode, and of the writers, Debra Frank, and Carl Sautter, who has since passed away. Debra does a great job in talking about the writing process of "Dream Sequence", and together with Glenn's insight makes this a great commentary about a ground breaking episode. I then dove into the rest of the episodes without commentary, and all I can say is WOW! I already commented about the beautiful color, but for all the fans of the trademark Moonlighting banter, I've gotta say you just can't wait to hear it! The sound is clear as a bell, every word, every syllable of the dialogue is just perfect. And the music! Those who have struggled through the dilemma of getting Moonlighting to DVD know that the music has always been a major sticking point. Hundreds of original songs were used during the production of the series, and I am happy to report that the music is 100% intact. Thank goodness for the persistence of Glenn Caron - Moonlighting just wouldn't be Moonlighting without its music. And I must not forget all of the original music of Alf Clausen, the themes and background music that gave Moonlighting its very distinctive sound. I could wax poetic for hours on this, but I have got to tell you, the best thing to do is just watch! I spent a very happy few days reliving some of my favorite memories...the kiss in the window from "Dream Sequence", David catching the cork in "Money Talks", the meeting on the stairs in "Atlas Belched, the sexist banter from "The Next Murder You Hear"...of course, the favorite scenes are just too numerous to mention. This is a special gift. The attainment of this dream required the support and commitment of many people, both famous, and not famous, all united in the belief that this show was something special and deserved a new life on DVD. It took forever...and then it took no time and all. We have our favorite TV series on DVD and all is right with the world. Do I feel good? Do bears bear? Do bees be?